The bringing in of a New Year is a natural period for reflection. For many, it’s a time to kick start the job search in hope of new challenges, better working conditions, and more exciting opportunities. Whatever your reasons for starting your job search, the prep you do beforehand is vital. The steps you take now will give your New Year job search the best chance of success. To help you prepare, here are 7 things you can do right now. In readiness for your job search, the first thing you need to do is get your CV up to scratch. Reflect on 2016 and take stock of any key achievements. List the projects that you were involved in, highlight your areas of responsibility, describe any technical challenges that you helped overcome, and detail your successes. As an IT professional, your digital presence is arguably more important than your paper based CV. At the centre of your professional presence is your LinkedIn profile, consider it your career’s landing page. Increasingly, recruiters are actively searching for high-quality candidates directly on LinkedIn. If you want to be in the running for exciting new roles, your LinkedIn profile has to speak to searching recruiters. Just as websites need to be SEO ready, so too does your LinkedIn profile. Use the must-haves or essential criteria from the jobs you’re looking for to help plan the keywords to use in your profile. Once you’ve made your profile keyword friendly, it’s time to turn your attention to your headline and summary. Your headline needs to be eye-catching and action oriented. As well as your job title, include a key quality or characteristic – if your headline can stand out from the crowd of generic job titles, you’re in with half a chance. The other easy way to supercharge your LinkedIn profile is to tweak your summary. Incorporate quantifiable nuggets that highlight your work history and show a recruiter why they need to contact you. You could even include a call-to-action that shows you’re ready to be contacted. In the IT industry, employers and recruiters often review an applicant’s other social media profiles. Why wouldn’t they? It’s one of the easiest ways to get a quick insight into what an applicant might be like. Google yourself and see what comes up. If you find anything that might not look good professionally, take the time to change your privacy settings. When an employer or recruiter Googles you, they should only get professional search results. Ideally they’ll find content you’ve created, discussions you’ve been a part of, and groups that you actively contribute to. It’s never too early to practice for your next interview. A good starting point is to research current interview processes for the roles that you’re applying for. 2017 is likely to see a lot of employee turnover within the IT industry, so be sure to talk to peers and ex-colleagues to get an idea of the types of interviews and questions people are being asked. 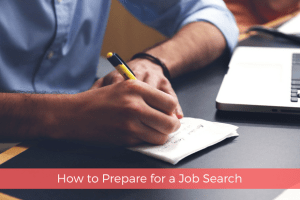 The key is to be ready before you apply for a job. The IT industry moves quickly, and it’s not unheard of to be offered an interview at short notice. By preparing now, you’ll be ready to take any opportunities that come your way. Before you start your job search in earnest, you need to know what you’re looking for. Think about your ideal job or company, and start researching what’s out there. If you have specific companies or roles in mind, use your network to get an inside track on upcoming positions, and ideally find out what employers are looking for. Once you’ve done that, you’ll be more able to align your CV and LinkedIn profile to the skills and experience employers are looking for. A new year is a great time to reflect on your strengths and weaknesses. Any strengths can be highlighted, and any weaknesses can be worked on. Are there skills that you’d like to improve? What skills are going to be in-demand in your niche in the coming year? Do you need to improve your coding skills, learn a new programming language, or improve your UX/UI skill set? Whatever it is you need to do, you’ll need to be proactive and dedicated to make yourself more employable in 2017. To help you make the most of 2017, you need to identify and set the goals that are key to your career development. Where would you like to be this time next year? What would you like to have achieved? The key to goal setting is to set SMART goals – be specific, set measurable goals that have a definitive end, set achievable goals that are realistic, and critically…. give your goals a time-limit for achieving them. By setting goals now, you’ll have a clear path for success and be more likely to get the opportunities you want going forward.